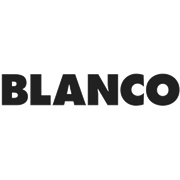 Blanco ovens boast remarkable kitchen solutions where form and function live in perfect harmony. With black glass and stainless steel finish, easy to use controls and black enamel cavity, this oven is easy to use while adding impeccable style to your kitchen. 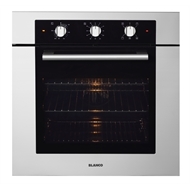 Large oven capacity - At 66 litres, this larger capacity oven will accommodate even the biggest of meals. Triple Glazed Thermo-reflective Door - The triple layered door with thermo-reflective glass offers not only a cooler to touch surface but also increases the energy efficiency as the heat is retained within the oven. 60 minute Minute Minder - The useful and easy to use minute minder will alert you when the selected cooking has elapsed. Black Enamelled Cavity - The oven is made so that it’s simple to clean. The smooth black enamel is not only easy to clean but also resistant of acidic spills. 5 Shelf Positions - Offering greater flexibility when cooking. The 5 shelf positions allows for more usable space within the oven.